Each school year, thousands of Georgia students transfer schools for reasons other than grade promotion. Student mobility not only affects the individual student but also the teacher and students in his or her classes. In June 2014, GOSA published a report on student mobility during the 2012-2013 school year. This education update analyzes mobility patterns during the 2013-2014 school year. In general, patterns in the 2013-2014 data are similar to those in the 2012-2013 data. 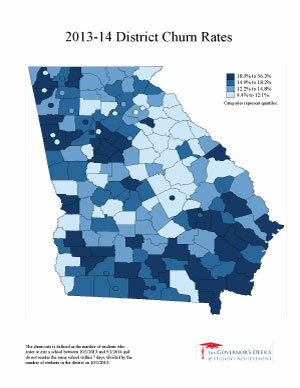 Approximately 10% of Georgia public school students switched schools during the 2012-2013 and 2013-2014 school years. In a majority of school withdrawals, the student transferred to another public school within Georgia. For most schools, the churn rate is similar in 2012-2013 and 2013-2014. In general, as a school’s churn rate increases, its score on the College and Career Ready Performance Index (CCRPI) decreases. To count as “mobile” for the purposes of this analysis, students must have entered or withdrawn from a school between October 1 and May 1. October 1 is the Georgia Department of Education’s (GaDOE) fall enrollment count date. May 1 represents a consistent date that is prior to the end of the school year in all Georgia districts. Students who withdrew and reentered the same school within seven days are not counted as mobile. In 2013-2014, the average school churn rate was 22.6%, but the median rate was 16.5%. The rates ranged from 0.0% (Kitteredge Magnet School in DeKalb County) to 777.8% (Community Hope Center in Dublin City). The average difference between the 2013-2014 churn rate and the 2012-2013 churn rate is -0.2 percentage points, with a median difference of -0.3 percentage points. For most schools (62.5%), the 2013-2014 churn rate is within three percentage points of the 2012-2013 churn rate. In other words, for most schools, the churn rate of students within a school year generally stays constant from year to year. At the district level, the average churn rate was 15.4%, and the median rate was 14.8%. Chickamauga City Schools and the Trion City School District had the lowest churn rate at 4.4%, and Montgomery County had the highest churn rate at 36.2%. The average and median churn rates in 2013-2014 are similar to those in 2012-2013. A list of the 2013-2014 school- and district-level churn rates can be found at the bottom of this page under “Related Files.” Click here to download the 2012-2013 school churn rates and here for the 2012-2013 district churn rates. The map below illustrates the 2013-2014 churn rates. Figure 1: Map of 2013-2014 District Churn Rates. At the student level, of the 1.7 million public school students in the 2013-2014 academic year, approximately 176,000 students, or 10.1%, were mobile during the school year. In a majority of school withdrawals (59.3%), the student transferred to another public school within Georgia. The top five reasons for transferring are listed below. White students comprised 42.5% of the students in Georgia public schools but only 32.5% of mobile students. Conversely, black students made up 37.1% of all students but 47.6% of mobile students. For all other races, the percentage of students in the overall population was similar to the percentage in the mobile population. English Language Learners (ELL) and Students with Disability (SWD) were more slightly likely to be mobile than students not in those categories. Eleven percent of ELL students were mobile compared to 10% of non-ELL students, and 12% of SWD were mobile compared to 10% of non-SWD students. In general, as a school’s churn rate increased, its score on the College and Career Ready Performance Index (CCRPI) decreased. Each year since 2011-2012, the Georgia Department of Education has produced CCRPI scores for schools and districts to serve as the statewide accountability system. The CCRPI score is out of 110 points (100 points and 10 challenge points). 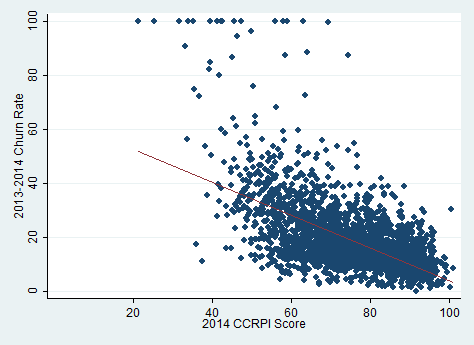 The figure below illustrates the relationship between the churn rate and the CCRPI score. Based on the data available, we cannot make claims about whether a school’s churn directly affects its CCRPI score. A school’s churn rate provides meaningful information about its learning environment. This education update finds wide variance among schools in terms of churn rates. However, the percentage of students who move, their reasons for moving, and most school’s churn rates tend show little change over the two years studied. October 2, 2012 was fall enrollment count date for the 2012-2013 school year. In Georgia, each state school and state charter school comprises its own district. Montgomery County has the highest churn rate among districts when state schools and state charter schools are excluded. Schools with mobility rates greater than 100 were recoded to equal 100 for display purposes. When a school utilizes the Community Eligibility Provision (CEP), it provides free lunch to all students at its school. As a result, the school does not have information regarding whether each student is eligible for free or reduced-price lunch (FRL) on an individual basis. As a result, the FRL indicator that is often used to measure poverty is no longer reliable for many schools. For this reason, this education update does not analyze mobility based on percent FRL. For more information on CEP, click here. This section uses a school’s “single score.” The correlation between these two variables is -0.42. For display purposes, all churn rate above 100% are recoded to 100%.